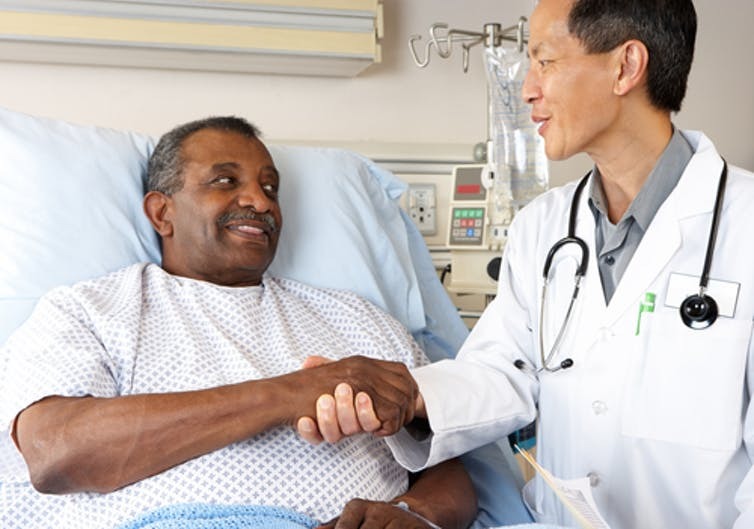 michaeljung/Shutterstock.com Providing tools to help African-American men with prostate cancer make decisions about care can make a big difference. African American men have the highest risk of being diagnosed with prostate cancer as well as dying from it compared to any other ethnic group in the U.S. This trend has remained unchanged for over four decades. Although research has focused on identifying the biological differences that may lead to this difference, there’s growing evidence that distinct racial and ethnic disparities in prostate cancer treatment, and the quality of medical care in African American men, contribute to this disparity. African American men are less likely to receive more aggressive treatments than their counterparts. And, if and when they do receive those treatments, they receive them later than their counterparts. For example, access to early effective survivorship treatments such as androgen deprivation therapies remains a challenge in African American patients. Our multidisciplinary research program in cancer population science at the University of Virginia has been examining reasons for poor prostate cancer outcomes, especially in African American patients. Recent, as yet unpublished research from our group highlights several issues related to medication challenges in elderly prostate cancer survivors. We found there is a clear link between improved use of these treatments and reduced mortality. In addition, both access and use of these life-saving treatments remain low among African American survivors. African American prostate cancer patients face unique challenges in the treatment decision-making process. These include lower rates of understanding of treatment options, less time and interaction with medical care professionals and, often, poorer quality of medical care. Those challenges particularly affect both their access and compliance to medications, and, in turn, outcomes in these patients. For example, Mr. Tyler(name changed), a 69-year-old African American man whom we interviewed for our research, along with his wife, Mrs. Tyler, sat in an exam room while his doctor told him he had stage 4prostate cancer. Stage 4 cancer is cancer that has spread from its original site to distant organs and, in prostate cancer, even the bone. He had not been to see a health care provider in about 12 years. He was always so busy at work and did not really feel comfortable going to a health care provider, having heard stories from family members and friends that other African Americans are not treated well at the hospital. The health care provider gave a recommendation, but his wife was unsure. They were confused and anxious about making such a big and complex decision. The couple relied on information they received from speaking to friends, church members and relatives and ultimately made a decision, but it was not easy. And, it was not free from some regrets. Ultimately, they chose to receive the radiation treatment and start the androgen deprivation treatment, which Mr. Tyler stopped because of discomfort. Mr. Tyler, unfortunately, died shortly after he discontinued treatment. Monkey Business Images/Shutterstock.com Careful sharing of information and helping patients to decide treatment are especially important to help close the gap in outcomes between Black men and other ethnic groups with prostate cancer. 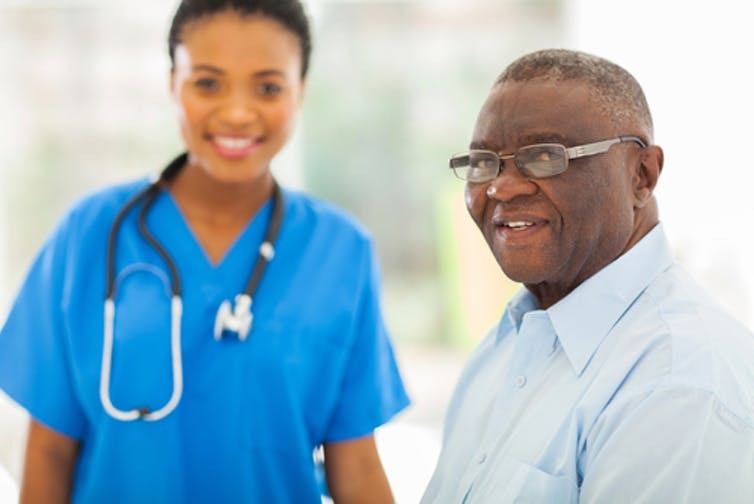 Research has shown that these treatment-related decisions are very different in African American prostate cancer patients compared to white patients and those residing in urban and rural communities. Therefore, there is a need to study treatment decision-making in both settings to formulate effective educational interventions. fizkes/Shutterstock.com Providing information and discussing all options is especially important in the treatment of prostate cancer.